Washington - The crew of a Dallas police helicopter was searching for a capsized boat last March, when there was a loud explosion and wind rushed through a huge hole in the windshield. The pilot, Sgt. Todd Limerick, put a hand over one eye, his face covered in blood and Plexiglass shards. He kept his other hand on the controls until the co-pilot, Cpl. Laurent Lespagnol, took over and landed the aircraft. Reports of helicopter bird strikes are up dramatically in recent years, including incidents, like the one in Dallas, that damage the aircraft and create the potential for crashes, according to the Federal Aviation Administration. 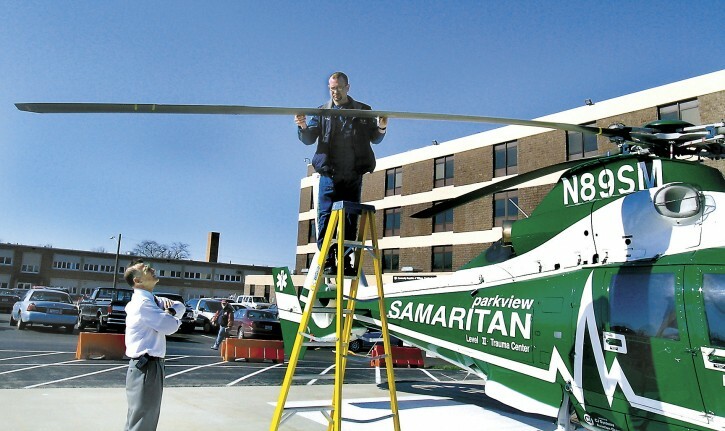 In 2013, there were 204 reported helicopter bird strikes, a 68 percent increase from 2009 when there were 121 reports and an increase of over 700 percent since the early 2000s, said Gary Roach, an FAA helicopter safety engineer. The increase is due partly to greater awareness among pilots about the importance of reporting bird strikes since the January 2009, when US Airways Flight 1549 was ditched in New York’s Hudson River after the airliner’s two engines sucked in geese. The Canada goose population in the U.S. and Canada increased from about 500,000 in 1980 to 3.8 million in 2013, according to the U.S. Fish and Wildlife Service. During the same time period, the North American snow goose population increased from about 2.1 million to 6.6 million. Other large-bird species with rising populations include bald eagles, wild turkeys, turkey vultures, American white pelicans, double-crested cormorants, Sandhill cranes, great blue herons and ospreys. Despite the increase in big birds and overall bird strikes, the number of incidents in which airliners and other fixed-wing planes suffered serious damage from a bird strike has been dropping, in part because of efforts to keep airports and their surroundings free of large birds. The reverse is true of helicopters, which fly at lower altitudes around lots of birds. “We’re getting more severe damage, more frequent cases of birds penetrating the windshield and the risk of pilot incapacitation that could cause fatalities for everybody there,” Roach told a recent meeting of FAA’s aviation rulemaking advisory committee. He cited the example of a helicopter pilot in the Gulf Coast region who was flying at about 1,000 feet and 115 mph when two ducks slammed through the windshield and hit him in the face. The pilot had so much bird gore on his face, he couldn’t immediately breathe or see. Some of his teeth were knocked out, his jaw wouldn’t close for a month and he needed stitches. But he still managed to land the helicopter without injuring any of the other five people on board. In another instance, a bird came through the windshield and knocked the pilot unconscious, but a passenger on board was qualified to fly the helicopter and landed the aircraft, he said. Roach and his colleagues at FAA’s helicopter directorate are urging that a special industry committee be established with government backing to examine whether there should be changes in the standards for helicopter construction and operation to better protect against bird strikes. The committee would also investigate whether technology is available to quickly disperse birds in the way of helicopters, possibly using strobe lights. An engineer for the Helicopter Association International, which represents operators, told the advisory committee that air medical services are reporting about one helicopter bird strike a week. There should be no difference between the way the FAA treats birds and the way they treat drones. Supporters of unregulated drone use should use this to oppose FAA regulation, and they should point out that not one drone has yet been cited in a collision incident. Certainly, there hasn't been anything on the scale of the reported bird strikes.